Krishna District Profile ,Mandals and Tourist Places in AndhraPradesh State: Krishna district is one of the coastal districts in Andhra Pradesh. The district is located on the banks of Krishna and got its name. The district has West Godavari on the east, Khammam district on North, Bay of Bengal on South as boundaries. The constituencies in the district are Penamaluru, Gannavaram, Vijayawada East, West constituency, Middle constituencies, Machilipatnam, Pamarru, Gudivada, Kaikaluru, Pedana, Avanigadda, Mailavaram, Jaggayyapeta, Tiruvuru, Nuzividu, and Nandigama. Let us now know about Krishna district history. Earlier, it was ruled by Satavahanas. It was earlier named the ‘Machilipatnam district’ and was named Krishna in 1859 after some talukas in Guntur districts were also merged in Krishna district. 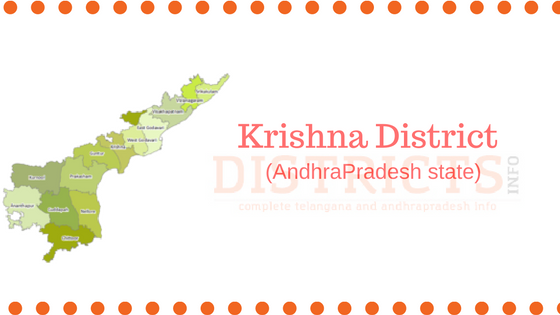 in 1925, Krishna district was divided into Krishna and West Godavari districts. The place was ruled by Satavahanas, Cholas, reddy kings and Golconda nawabs. Vijayawada in Krishna district attracts a large number of tourists as there are many interesting places in the district including forts and temples. 1)Kondapalli is one of the Krishna district tourist attraction places. This lies between Nandigama and Vijayawada towns. Kondapalli is famous for the wooden toys. The toys are made with a special wood got from the trees grown in this area. 2) Kanaka Durga temple is in the hills of Indra Keelaadri in Vijayawada. Lakhs of devotees visit the temple every year. It is said that Arjuna did penance for Lord Shiva on this hill. 3) World popular Kuchipudi village is also in this district. 4) Kolleru lake is also located in this district and the Pelicon bird can be seen here. 5) Hamsala Devi is another tourist attraction. This village is in Koduru Mandal. River Krishna merges in the Bay of Bengal near this village. This place is very beautiful. 6) Prakasam barrage is another attraction of Vijayawada. The barrage is constructed at the foothill of Indrakeeladri. It was constructed in the year 1957. 7) Victoria museum has more than hundred years of history. The museum was launched in the year 1887. There are many artifacts including those used by early man. After bifurcation of the Andhra Pradesh into Andhra Pradesh and Telangana, Krishna district is gaining popularity as the new capital Amaravati being constructed near Vijayawada, one of the biggest city in the state. Vijayawada is also the biggest railway junction. Vijayawada is one of the best educational centers in Andhra Pradesh. There are many engineering colleges and also School of Planning and Architecture university. Dr. NTR health university is the first health university in the country and it was established in the year 1986. Then chief minister of the state Nandamuri Tarakaram0arao set up the university. River Krishna is the major river that flows in the Krishna district. It flows for 125 kilometers in the district and meets the Bay of Bengal at Hamsaladeevi in Diviseema. seventy percent of the people in this district depend on agriculture. Rice and sugarcane are the major crops.